Growing up in China, we eat rice for almost every meal, a warm bowl of congee for breakfast, a plate of savory & oily fried rice for lunch, and some light & fully steamed rice for dinner. Since rice was brought to Italy in the 1400s by spice merchants through the silk road, and most rice dishes around the world have a Chinese root, that’s why when I started cooking in an Italian restaurant, risotto was the first thing that I mastered, a creamy, tender rice dish that is perfect for almost any occasion. It’s perfect as the primo, a dish before the main course; however, it is also perfect with osso buco alla milanese, which is one of my favorite Italian dishes. 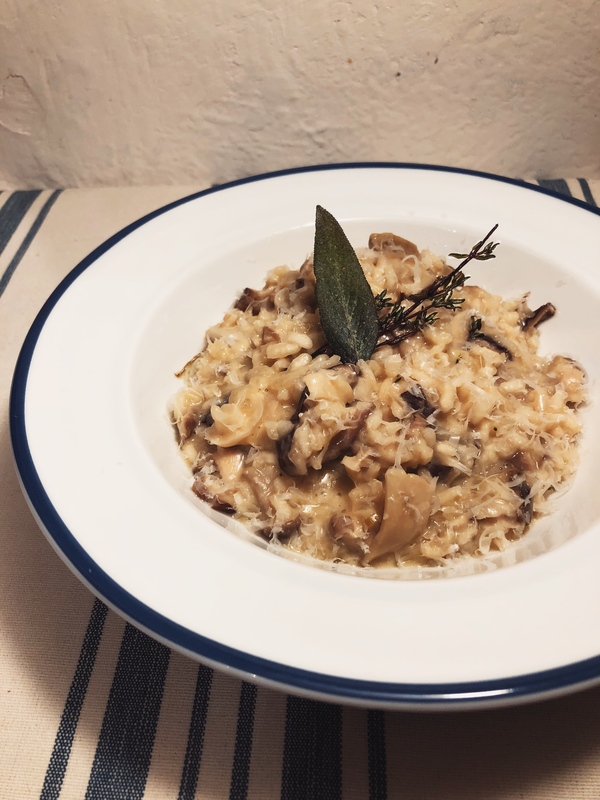 Since risotto is a dish that the city Milan is famous for, it requires some butter (most Italian dish uses only olive oil, but not this one), and the lovely mushrooms that can only be find in the northern Italian forests. Some of these mushroom might be hard to find, but I will provide a more common substitute in the recipe. Place the dried mushrooms into a bowl and cover with boiling water, this will re-hydrate the mushroom. Heat up a deep pan over medium-low heat, add half of the butter with the olive oil. Peel and finely chop the celery, garlic and onion, add them into the pan with some salt & black pepper and cook them for about 10 min or until they turn soft. Add the rice into the pan, lightly fry while stirring it until it turns slightly translucent. Strain the dried mushrooms, save the liquid. Clean and roughly chop the mushrooms, add them into the pan with thyme springs, turn up the heat to medium then cook until most of the liquid are evaporated. Pour in the wine and cook until the liquid turns viscous, then add 1/2 cup of the mushroom liquid and the stock. Bring everything to a boil and reduce the heat back to medium-low, stir constantly, and cook for about 20 min, add more liquid if need. Once the rice hits al dente, pick out the thyme and add the rest of the butter with the Parmesan cheese, stir until it becomes amazingly creamy and oozy. Sever it with some extra Parmesan and herbs, and enjoy!